Yesterday, in honor of Black History Month, Jezebel posted this great piece showcasing retro Black hairstyle photos submitted by their readers. 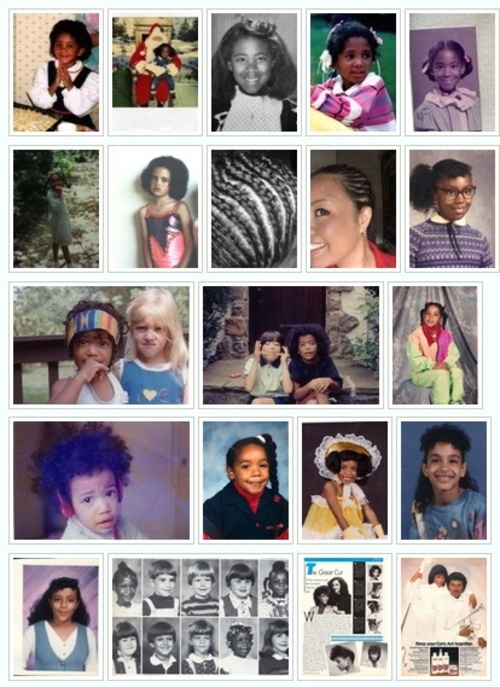 Clicking through these pictures of little girls adorned with barrettes and beads galore really brought me back to the days of 15-hour blowdrying and hair-braiding sessions. Oh, how I dreaded those Saturdays. My mom and I would watch Baywatch or I’d play rented Nintendo games as she systematically parted, blow-dryed, hot-combed and rebraided my frighteningly think hair. In fact, the whole ordeal was so remarkably unforgettable that I recounted it in one of my college application essays. Judging from these photos, it looks like my hair story is not unique. Also looks like a lot of moms, just like mine, spent countless hours making their babies look beautiful. So it all worked out in the end. Can you guess which photo is mine? The hint’s in the title of this post. So I just found this blog today via a Google search (I'm always looking for styling tips for my hair texture), and it's really exciting/uncanny how similar my hair is to yours. I've definitely used some of the same products (Garnier soft curl creme rocks my world! ), had the same curling iron/relaxer burned childhood, and i think we have pretty much the same haircut right now. Please keep posting your new style experiments and product tests, so that I can try them too!